NASA leaders hold this news briefing to announce shuttle Atlantis' launch date and recap the Flight Readiness Review. NASA completed its initial constellation of Tracking and Data Relay Satellites with deployment of the TDRS-G by shuttle Discovery. A package of ultraviolet telescopes flew aboard shuttle Endeavour in March 1995 to observe Jupiter, stars and galaxies. The crew explains its mission in this film. 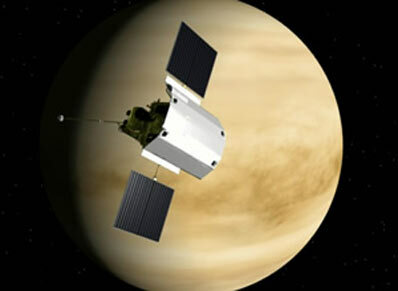 Mission operators at the Johns Hopkins University Applied Physics Laboratory (APL) in Laurel, Md., said MESSENGER's systems performed flawlessly as the spacecraft sped over the cloud tops of Venus at a relative velocity of more than 30,000 miles per hour, passing within 200 miles of the surface of the planet at 23:08 UTC (7:08 p.m. EDT). For 20 minutes during this closest approach, MESSENGER was within the shadow of Venus, and in the absence of solar power the probe relied solely on its internal battery. By 1:32 UTC (9:32 p.m. EDT) the battery had fully recharged, and the spacecraft was operating as planned. "The biggest milestone for mission operations was first acquisition of�telemetry following closest approach, and confirmation that the battery was fully recharged following the 20-minute solar eclipse," said APL's Andy Calloway, MESSENGER's mission operations manager. "We will be monitoring recorder playback beginning June 7 to make sure all of the files and images are�fully downlinked. Next stop, Mercury on January 14, 2008!" This second Venus flyby was a critical mission milestone in the probe's circuitous journey toward Mercury orbit insertion, declared MESSENGER principal investigator Sean Solomon, from the Carnegie Institution of Washington. "Not only did the maneuver sharpen the spacecraft's aim toward the first encounter with Mercury in more than three decades, it presented a special opportunity to calibrate several of our science instruments and learn something new about Earth's nearest neighbor." According to APL's Eric Finnegan, MESSENGER systems engineer, the spacecraft's approach geometry is similar to that for the first Mercury flyby, allowing � for the first time in flight � the craft's seven instruments to be turned on and operated collectively in science-observing mode, just as they will be for Mercury. "Gathering approximately six gigabits of data, the spacecraft will take more than 630 images, as well as make other scientific observations over the next few days," Finnegan said. The team plans to image the upper cloud layers at visible and near-infrared wavelengths for comparison with earlier spacecraft observations. Magnetic field and charged particle observations will be made to characterize solar wind interaction and search for solar wind pick-up ions. Ultraviolet (UV)-visible and X-ray spectrometry will permit detailed observations of the composition of the upper atmosphere, and MESSENGER will search for lightning on the Venus night side. "We are very excited with this next step in reaching our ultimate destination, Mercury," said APL's Ralph McNutt, MESSENGER project scientist. "The data acquired with all of the instruments should begin arriving back at the Deep Space Network tracking stations just after 12 p.m. EST on June 7, with more data coming down during the next few days. By June 8, we should have our color mosaic, as well as our laser altimeter observations; and these will be critical to beginning several of the collaborative studies with our scientific colleagues on the Venus Express team." During this Venus encounter, MESSENGER joined forces with the European Space Agency's Venus Express spacecraft, currently orbiting Venus, to make joint observations of the Venus environment. "Although Venus's atmospheric interaction with the solar wind was studied extensively by Pioneer Venus Orbiter in the 1980s, there has never before been an opportunity to measure simultaneously both interplanetary conditions and the particle-and-field characteristics at Venus," says McNutt. "The combined MESSENGER and Venus Express observations will be the first opportunity to conduct such two-spacecraft measurements and should enable advances in our overall understanding of this interaction." Next up for MESSENGER is a trio of swings past Mercury in January and October 2008 and September 2009. During these flybys, MESSENGER will map most of the planet and determine surface and atmospheric composition; these data will be used to help plan priorities for the yearlong orbital mission, which begins in March 2011. "The spacecraft and its operations team are poised to embark on the most intensive period of trajectory activities of the mission," says Finnegan. "Over the next 18 months, the spacecraft will travel on a veritable inner-planetary roller coaster. Three passive gravity assists will be conducted, one by Venus and two by Mercury. Three Deep Space maneuvers will also be executed, using the large main engine of the spacecraft. In addition, 13 maneuvers utilizing smaller thrusters are possible in the event that periodic corrections to the trajectory are necessary along the way. All told, this adds up to a very high tempo of operations." MESSENGER Project Manager Dave Grant, of APL, said the work of the MESSENGER team of engineers and scientists in completing this second Venus flyby has been outstanding. "Our adherence to the designed mission trajectory and demonstrated performance of the science payload lends confidence to the ultimate success of the MESSENGER mission, and critical experience has been gained for managing future flybys and eventual orbit insertion at Mercury," Grant says. The MESSENGER project is the seventh in NASA's Discovery Program of lower-cost, scientifically focused space missions. APL built and operates the MESSENGER spacecraft and manages the mission for NASA's Science Mission Directorate, Washington. The Applied Physics Laboratory, a division of The Johns Hopkins University, meets critical national challenges through the innovative application of science and technology.